Below is my previous column article, from September 15, 2013. Ideals are everywhere. They manifest in advertisements, and live on screens. Though they may seem harmless, they take root in our lives, like poison ivy, and slowly whisper to us that we will rot if do not conform to them. The danger comes when we start to believe that they are real, and struggle to live up to them. They may make us work harder at times, which is a good thing, but if we go overboard in pursuing them, that can only end in disaster. We live in a harsh reality, and ideals are misplaced in this world. In an ideal world, everything would be black and white. Either something is right, or it is wrong; either we should do it, or we should not. But this is reality, and sometimes, even morals may not be so clear. In the play An Ideal Husband, Sir Robert does something considered dishonorable to launch his political career. But in the years that follow, he works for the good of the people, and becomes a model of goodness. So how then, is one to judge him – as a bad person, for compromising morals, or as a good one, for the many positive things he does after that? Ideals make it seem easy to judge moral values, but reality blurs the lines between what is right, and what is wrong. 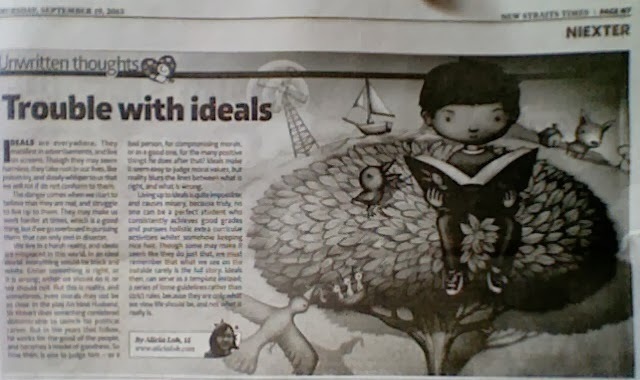 Living up to ideals is quite impossible, and causes misery, because truly, no one can be a perfect student who consistently achieves good grades and pursues holistic extra-curricular activities whilst somehow keeping nice hair. Though some may make it seem like they do just that, we must remember that what we see on the outside rarely is the full story. Ideals then, can serve as a template instead; a series of loose guidelines rather than strict rules, because they are only what we view life should be, and not what it really is.